When choosing a carpet, there are a lot of factors to bear in mind. From general wear and tear and how long you would like your carpet to last, to the cost of fitting and underlay, our guide to choosing a carpet is here to advise and inspire. Carpet is certainly the most comfort-enhancing option, making it a popular addition to living rooms and bedrooms, and while it may not be as easy to care for as other flooring options – think laminate and solid wood – there is no better choice for comfort, warmth and sound absorption. Still deciding what flooring option is best for your home? You'll find plenty of handy advice and inspiration over on our flooring hub page. 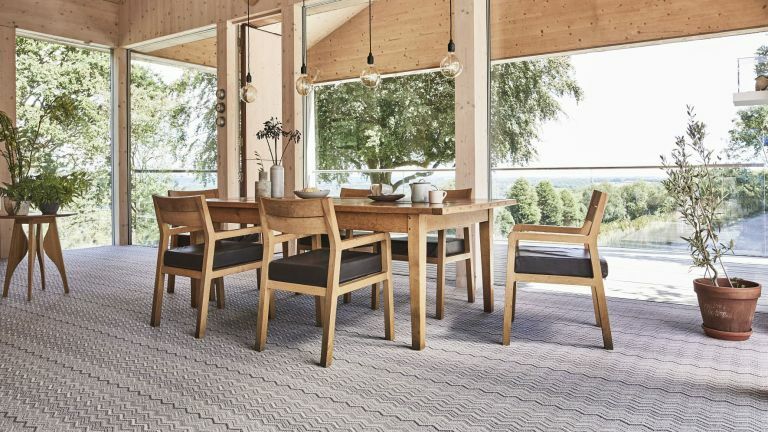 You can buy a corded foam-backed carpet from as little as £2.99 per square metre from stockists such as Carpetright, with costs at some high-end suppliers reaching over £100 per square metre. On average, you are looking at around £20 per square metre for polypropylene carpet and £30 per square metre for wool-rich carpet plus underlay and fitting. There are two types of carpet, woven and tufted. Woven carpet is made using a labour-intensive method whereby colours and decoration are woven in rather than printed onto the surface. A high-end product, it is usually made from 80 to 100 per cent wool, and it comes in two forms: Axminster, often patterned with a velvet finish, and Wilton, which can be plain or textured. Tufted carpet is the most popular type, with a more varied choice of styles. It is made by punching the pile yarn into a backing fabric using needles, which produces cut and loop pile designs. Which carpet material to choose? When it comes to choosing the material for your carpet, the main consideration is whether you prefer natural or synthetic. Both have their benefits, so it is mainly down to your personal choice – and budget. Wool has long been used in carpet manufacturing and is still recognised as the best fibre. It has a luxury feel and a low propensity to soil. It is also naturally flame-retardant. Wool is resilient, soft and warm, and retains its appearance. Both 100 per cent wool carpets and mixes with man-made fibres in an 80/20 or 50/50 ratio are available. The latter two may be better for busy thoroughfares like halls and stairs. Don't rule out synthetic, though: extremely hardwearing, with a high resistance to abrasion, nylon is easy to clean. It’s often used in an 80 per cent wool and 20 per cent nylon blend. Polypropylene is another good option; highly stain-resistant, man-made fibre with good abrasion resistance. It’s typically used in twists, loop piles and Saxony types. Floorcoverings made from plant fibres are great for creating a relaxed and rustic effect, and can be fitted wall to wall, just like carpet. Sisal is hardwearing enough to be used in high-traffic areas around the home, including living spaces, hallways and stairs. Where’s the best place to buy carpet? We would recommend that you always buy from a reputable retailer. The Carpet Foundation has 700 members who operate under a Code of Practice approved by the Trading Standards Institute. You can expect a written quotation, so there are no nasty surprises on your bill (such as charges for moving furniture), a protected deposit, and free conciliation if you experience any problems. Where can I lay carpet? Always have your carpet fitted professionally; it’s a real skill and should be fitted in accordance with BS5325 – the British Standard for the installation of textile floorings. Carpet can be laid in any room, but is not recommended for kitchens, and most people avoid it in bathrooms. Halls, stairs and landings take the most wear and tear, so it is advisable to lay a hardwearing design in these areas, with at least 80 per cent wool content. You can be a little more indulgent in bedrooms, for example, that aren’t used as much. Consider man-made fibres such as polypropylene for kids’ rooms and dining spaces as it’s highly stain-resistant. It’s also worth noting that most carpets are suitable for use with underfloor heating, but it is advisable to check your choice with the heating system manufacturer. You can also find more tips on underfloor heating in our comprehensive guide. To keep carpet in the best condition possible, it's important to vacuum regularly – at least twice a week. Quickly tackle any accidents to lessen the chance of lasting stains; solids should be scraped up. Blot spills carefully, working from the outside in, and apply cleaning agent to a cloth, never directly onto the carpet. Our guide to cleaning carpets provides full instructions. We've also checked out the best carpet cleaning products and the best carpet cleaning machines if you don't think a vacuum will cut it. We've also reviewed – among others – the best vacuums for deep cleaning carpets and the best vacuums for pet owners. For a professional service, contact the National Carpet Cleaners Association. You can also hire carpet-cleaning machines: Rug Doctor cleaners cost from £22.99 for 24 hours. When it comes to carpeting stairs, there are two main types of carpet suitable: flatweaves and Wiltons. Wiltons are dense with a smooth, velvety feel while flatweaves are more flexible, making them an advisable choice for winding staircases. Fitting a flatweave carpet to winding stairs is a difficult job which should be done by a professional. In terms of colour, go for bold stripes or a pattern to make a statement, or neutrals for a more subtle finish. Choose your runner before you choose your paint colour, as you can then opt for a colour that draws out the more subtle tones of your runner. The rooms that lead off from the hall and stairs ought to have a similar colour scheme, though not necessarily the exact same shade. When laying a runner on the stairs, leave a minimum of 5cm up to a maximum of 15cm wood/paintwork showing on either side of the runner. Anything in-between is really down to personal preference. A bordered or non-bordered flatweave runner can be fitted on landings by way of mitred edges. Quarter and half landings can also be fitted in the traditional overlay fashion where one length of flatweave is laid perpendicular to the other. The seams and joins are either sewn by our skilled fitters on site or prepared in the workshop prior to dispatch. For a larger landing you may want to consider a fitted ‘wall to wall’ option. Skilled workers in the Roger Oates workshop hand sew the lengths together to create larger pieces that can then be fitted in a similar way to standard broadloom carpet. Looking for more information and ideas?